Protect your outdoor living space with the Napoleon Grill Mat. Keep your wood, stone, brick and pavement residue-free. Flame resistant and easy to clean. Protect your deck or patio from permanent stain damage. This mat can also be used for a variety of other purposes including a home entryway mat, collecting oil from your furnace or beneath your vehicle. The vinyl surface can easily be hand washed for repeated use. Protect your LEX 730 Built-in grill with this high quality grill cover. This grill cover is made from heavy duty PVC polyester. The material is UV protected to prevent colour fading and features a 3-inch ventilation strip to reduce moisture buildup under the cover. This cover features a large embroidered Napoleon logo to show your Napoleon pride. Protect your Built-In Grill with this durable, water resistant Premium Grill Cover for the Built-In LEX730 Grill Head. The fabric won't crack, and the improved UV inhibitors provide superior fade resistance. Easily store your cover out of the way with the convenient hanging loops. For year round full weather protection for your grill, the Premium Grill Cover can't be beat and is covered by a 3 year limited warranty. Protect your FreeStyle portable grill with this high quality grill cover. This grill cover is made from heavy duty PVC polyester with an elasticized bottom to keep it securely over your grill. The material is UV protected to prevent colour fading. This cover features a large embroidered Napoleon logo to show your Napoleon pride. 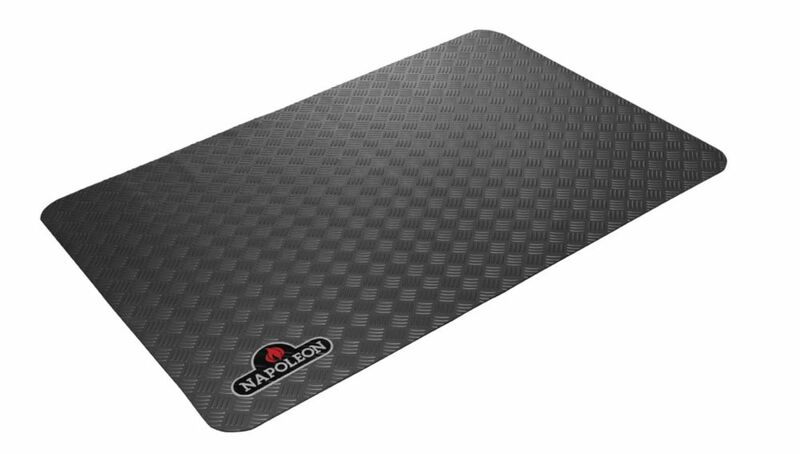 BBQ Mat Protect your outdoor living space with the Napoleon Grill Mat. Keep your wood, stone, brick and pavement residue-free. Flame resistant and easy to clean. BBQ Mat is rated 4.5 out of 5 by 6. Rated 4 out of 5 by Chief from Looks good, solid and nice weight. Perfect fit for our deck and Weber bbq. Haven’t used much yet. Rated 5 out of 5 by John B from Protects your deck from charcoal embers Love this deck mat. It protects our deck from being burnt by charcoal embers. What I didn’t expect is that it’s thick padding makes it really comfortable to stand on. Rated 4 out of 5 by Alan from Has good looks Haven’t had a chance to put it to the test as yet but from the feel appearance of the material the mat is made from, looks like it will do an excellent job protecting our deck from accidental spill of hot coals. Rated 4 out of 5 by what from barbecue mat good quality good size good delivery saves wear and tear on the deck.